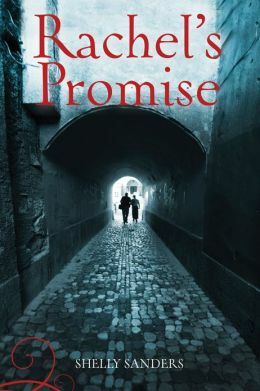 Book Synopsis: When Tony’s mother goes to jail for being cruel to animals, he is sent to live with a great-uncle he has never met in Sierra Nevada. It is a big move for Tony and different from his life in Los Angeles. Uncle Tio is a forest ranger and owns Gabe, a search-and-rescue dog (SAR). Tony learns the skills he needs to survive in his new environment. With the friendship of Gabe and the support from his uncle, Tony opens himself to a life and a future he never could have imagined. 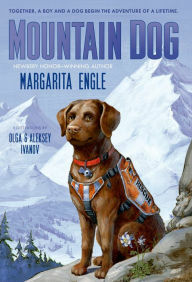 Margarita Engle writes a moving and sensitive novel that touches on historical facts that include immigration, unhealthy and healthy family relationships, cruelty of animals, and search-and-rescue dogs along the Pacific coast wilderness trails. It is a beautifully inspiring story written in free verse, with alternating chapters in Tony’s and Gabe’s voices. The language is strong and captures Tony’s pain as he struggles with his complicated feelings about his mother and his new life. Gabe shares his upbeat insights into Tony and his unconditional doggy love. I believe it is a story that will appeal to both genders. In many ways, this is a coming of age story for an 11-year-old boy who gets a real chance to experience family with his Tio and Gabe, as he settles into the search and rescue life of the community. The characters are realistic and memorable. There are friendships with Gracie and members of the Cowboy Church (which welcomes horses and dogs), and fellow hikers. The plot is original with moments of action and tension in the vast wilderness that will keep readers turning pages. There is no tidy ending with Tony’s mother. This is a very sensitive story about a boy who begins to dream, find purpose in his life, and heal. Readers will also enjoy the facts woven into the story about the choice and training of SAR dogs, what to do if you get lost, and survival tips. Olga and Aleksey Ivanov’s black and white illustrations of the SAR dogs in action, bears and wildlife, wilderness treats, and paw prints contribute significantly to Tony’s story. 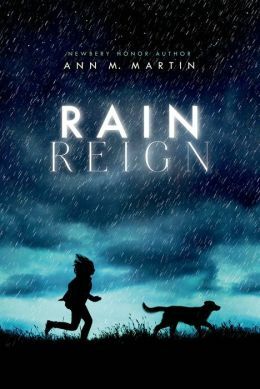 Resources: There is much back matter in the book from the author, who owns SAR dogs, which makes this a perfect classroom discussion book. 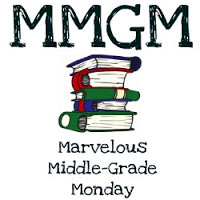 Margarita Engle is a Newbery Honor winner for The Surrender Tree and has written poems plus historical fiction works. 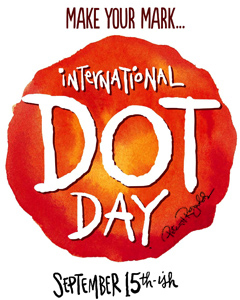 Visit Engle’s website where teachers can find activities for the classroom. Synopsis: Bear is unsure about his first day at school. He’d rather stay at home with Mama. Bear soon discovers that school can be fun. He paints, listens to stories, builds block towers, dresses up, gives a doll a bath, makes a new friend and plays on the playground. After school, Mama is waiting and Bear has a surprise for her. 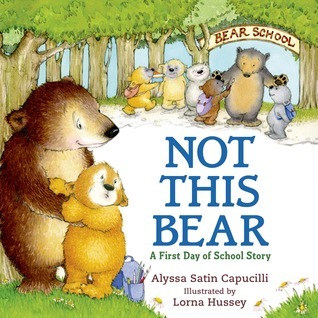 Alyssa Satin Capucilli has written a charming book for children who may be reluctant to attend preschool or kindergarten for the first time. 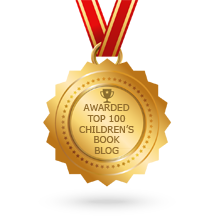 The book sweetly deals with separation anxiety from Mama and is comforting. As Bear hesitantly explores the new and exciting wonders of school, he makes a friend. What I appreciate most about this book is that Bear doesn’t choose gender specific toys and activities. He dresses up like a pirate, plays in the kitchen, and gives a doll a bath. When Bear goes to the playground he prefers to blow bubbles with another bear and make rainbows with chalk instead of swinging and climbing with the other cubs. 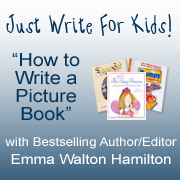 This is an excellent book to help prepare little ones for school. Lorna Hussey’s watercolor and ink illustrations are expressive, fun, and endearing. They really contribute to the cozy charm of the story. Resources: Reading this book to your child is a good way to jump-start a conversation about going to school for the first time. Like Bear, encourage your little cub to paint or draw without coloring books, learn to put things away, play games to learn to take turns, or make a book together about school. Most important, attend an orientation or visit the school ahead of time. 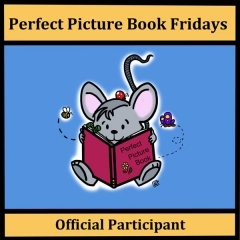 Even though Perfect Picture Books is on vacation until September 11, you can still visit author Susanna Leonard Hill’s Perfect Picture Books to see a complete listing of all thePerfect Picture Books (PPB) with resources. 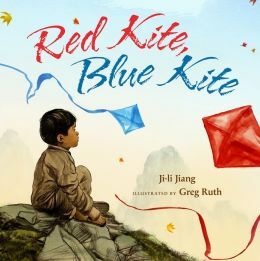 What I like this book: This is a beautiful and heartwarming story for children experiencing the loss or absence of a father. Susan Kerner gives no specific reason for a loss in her lovely rhyming text. Fathers may be absent for many reasons like work, military deployments, divorce, incarceration, and death. Through comforting verse, Kerner’s shows that their fathers are still part of them, whether it’s in their mannerisms and likeness to him or in everyday activities and nature. 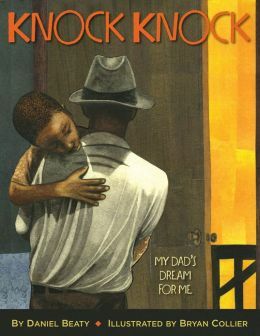 This book can be read to any child experiencing a father’s absence and help them know they are still loved. 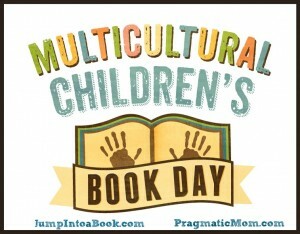 And Mama is there to remind them,“No matter the day, the month, the year, the weather, the tears, or smiles…Daddy is always by your side, guiding you all the while.” Haywood’s illustrations are lively, colorful and ethnically diverse. Families coping with loss will find Always By My Side a helpful grief book. Susan Kerner: Shortly after marrying the love of her life, her husband died of cancer before their first child was born. Her book is inspired by her own experiences. 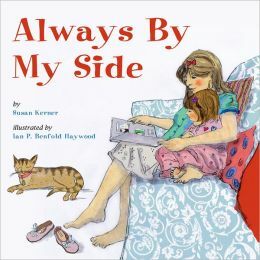 According to Kerner, Always By My Side has become popular among military families.